What It’s About: Traveling strongman Zampano (Anthony Quinn) buys the simple Gelsomina (Giulietta Masina) from her starving family to be his assistant. Zampano treats Gelsomina horribly and takes her for granted, but she remains basically positive and happy in her outlook. Things begin to change when Gelsomina meets a clowning acrobat (Richard Basehart) and both men begin working at the same circus. Why Watch it Today? : Dino De Laurentiis was born today in 1919. Laurentiis is perhaps best known among cult and genre film fans for producing genre films and cash-ins of all kinds, and of wildly varying quality, but he also produced great films that stood the test of time. 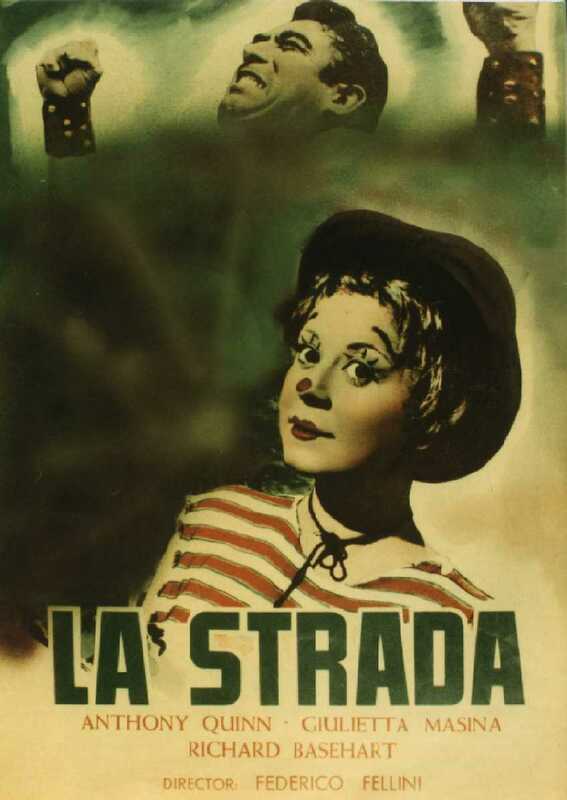 La Strada is one of these, an early film from the great Italian director Federico Fellini, often cited as his best by film critics. Other Choices: Laurentiis also produced Flash Gordon, Serpico, Barbarella, Nights of Caberia, and The Dead Zone. This entry was posted in "Foreign Film", Arthouse, Black and White, Drama, Movie of the Day, Neo-Realism, Road Trip, Tragedy and tagged "simple" people, acrobats, Anthony Quinn, Best Foreign Language Picture, Best Original Screenplay Nominee, Carlo Ponti, circus, clowns, Dino De Laurentiis, Federico Fellini, Giulietta Masina, homage, Italy, location shooting, love triangle, murder, Ponti-De Laurentiis Cinematografica, poverty, Richard Basehart, strongman.